When a maxi single with three versions of fat bass and breaks touches down, it feels like time travel to the eighties, to Compton and Macola Records, to the shining creative halos of Arabian Price, Professor X and all the homies. In current case, not the L.A.’s but The Hague’s posse is street cruising in a large convertible, replicating the vibe of the electro beat pioneers. The bass is ruthless and mutant voices rising from the sewers are giving thrills when in all dedication, a new label called Den Haag is set up by Syncom Data operatives. 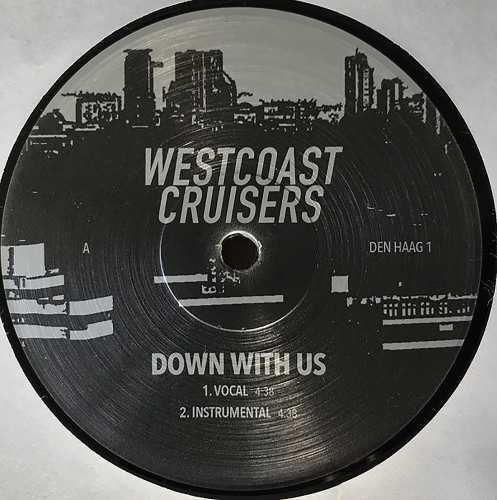 The anonymous collective Westcoast Cruisers has not fallen into a problem often heard in old school electro singles, when two common versions, vocal (vocoder) and instrumental, had only tiny differences. Although all three cuts of “Down With Us” share the basics, even after several listens they sound appealing. Scary bass is combined with the robo-voice narrative, which is tagging West Coast luminaries Rude 66, DJ Overdose, Dexter, etc., as well as the scene symbols like Bunker, CBS, Hotmix, Global Darkness. All three tracks are sporting caustic synth lines and metallic subtext, most prominently felt in the Motor Dub version, which is my favourite and could stand for an electro subgenre. Just shake your a** at synthetic palm trees in La Haya’s playa and keep yelling ‘bitcoin is my pension’.